This Excel VBA example shows how to restrict a combo box in a UserForm, so only items that match a list can be entered. Download the free workbook, to test the macro. This Excel VBA example is based on the instructions for Creating an Excel UserForm With ComboBoxes. On that page, the lists are added to the comboboxes by looping through a named range. a simpler technique is used to create the lists. the comboboxes are modified so that only items that match a list item can be entered. Watch the steps in this video, and the written instructions are below. 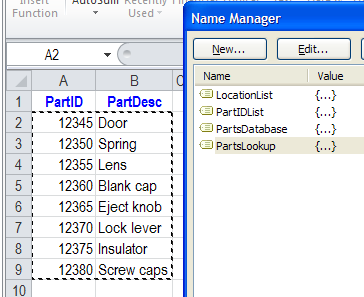 and a two-column ComboBox for Parts, showing the Part ID, and the part name.. The Location combobox is named cboLocation. It should show all the locations from a named range -- LocationList -- on the LookupLists worksheet. 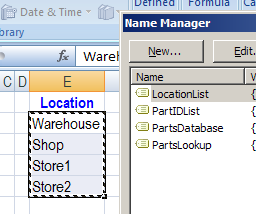 In the Visual Basic Editor (VBE), select the UserForm, and click on the Location combobox, to select it. 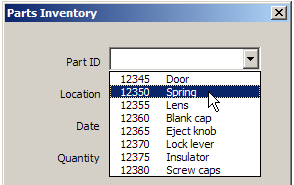 In the Properties window, find the RowSource property, and enter LocationList as the source. 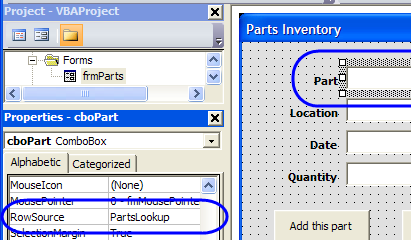 In the Visual Basic Editor (VBE), select the UserForm, and click on the Part combobox, to select it. 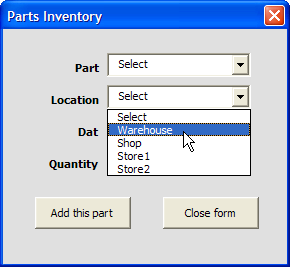 In the Properties window, find the RowSource property, and enter PartsLookup as the source. To prevent invalid entries in the comboboxes, change the ComboBox properties, so a match is required. This will result in an error message, if an invalid item is entered, and you try to leave the combo box. NOTE: An alternative is to check for invalid entries, when clicking the Add This Part button -- see the instructions in the next section. 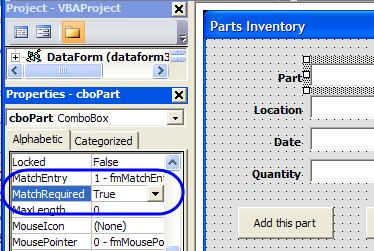 Select the Part combobox, and in the Properties window, change the MatchRequired setting to True. Repeat this setting change for the Location combobox. To check for invalid entries in the comboboxes, you can add code in the "Add This Part" button. . 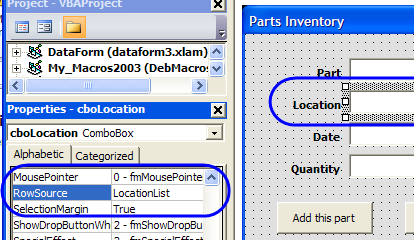 Select the Location combobox, and in the Properties window, change the MatchRequired setting to FALSE. Add code to check the ListIndex for the combo box. An example for the Location combo is shown below. MsgBox "Please enter a valid location"
Setting the MatchRequired property to True works well, unless your Excel VBA code tries to clear out the comboboxes, to prepare for a new entry. In this example, when you click the Add This Part button, the code removes the entries from the Part combobox and the Location combobox. When that happens, an error message appears, warning "Invalid Property Value." To prevent that error, add a "Select" item at the top of each named range. Then, in the code, add "Select" to the combobox, after the Add Part button is clicked, instead of leaving the comboboxes blank. Now, the first item in the combobox drop down list is Select, and only items from the list can be entered. 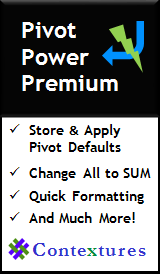 Download the zipped sample Excel UserForm ComboBox Match file to see the completed UserForm and Excel VBA code.